Real Madrid star, Marcelo, berated his teammates and clashed with Los Blancos captain Sergio Ramos in the training session. Real Madrid were knocked out by Barcelona in the Copa del Rey while Ajax also emerged as surprise winners in their Champions League clash, knocking Los Blancos out of the competition by an aggregate score of 5-3. Their captain, Sergio Ramos is having a horrible time at the Santiago Bernabeu after he missed the Ajax game and made headlines with his clash against Florentino Perez recently. He also missed the lineup against Real Valladolid due to a suspension but traveled with the squad. Meanwhile, Real Madrid's decorated left-back, Marcelo also fell out of the pecking order under Santiago Solari after a string of poor performances in the season. Real Madrid players were involved in a mini-game during their final training session before they faced Real Valladolid. 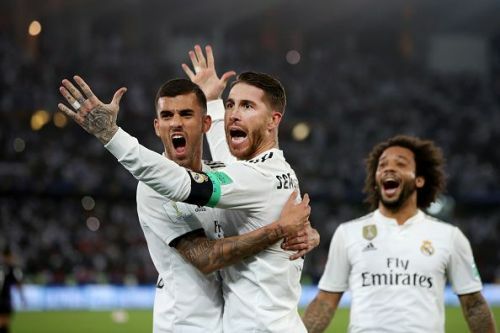 Marcelo, being on the winning side, rebuked his teammates and celebrated that win in a bad taste, which did not sit well with Sergio Ramos. Ramos did not hide his anger about Marcelo's attitude and expressed his feelings which led to a clash of opinions between the two stars. The tension eventually cooled off as both stars have a long-standing relationship, having played together for over a decade. Both Ramos and Marcelo admitted it was the result of a poor campaign they are enduring. Real Madrid currently occupy the third spot in La Liga and will be looking forward to improving their performances when they host Celta Vigo in their next La Liga game.